Audio Podcasts have become the recent rage in the blogosphere, with everyone from Scoble’s new podtech company to Kevin Rose’s hugely popular Diggnation podcast, participating in interviews, sending out words to huge audiences of listeners and blog readers is the new fad. A complete plethora of playing mechanisms and audience. You name it -nearly every device that is coming to market has podcast support. 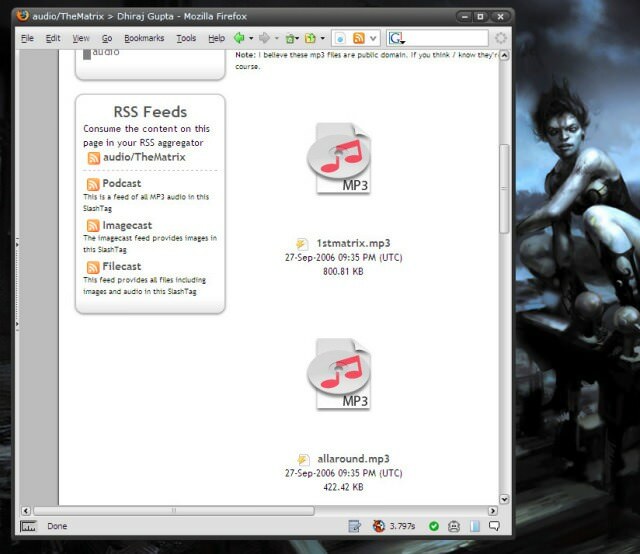 Step 1: Create audio: To podcast audio, you need to have one or more audio files. Audio files in podcasts are usually in the MP3 file format and MP3s can be created from just about anywhere these days, too. For the purpose of podcasting, you could record your voice using various software tools, I’ll be profiling these (if the time-space continuum permits, of course) later. You could even go full steam ahead and record a Skype or telephonic interview, I’ll put in a few words about these too, if I can. In essense, you need to have an audio file to broadcast / podcast it. It really is that simple. Step 3: Podcast! 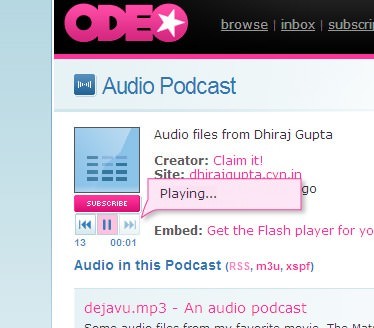 : You can now proceed to publicize your podcast feed. How do you do that? Simply copy-paste the Podcast feed URL into any podcast consumer and you’re set. Read on, I’ll show you how. Create a note:First, we need to create a note that will have our audio files. Simplypress the New Note button (on the top left) in your cyn.in site. Put ina title, and some content in the body - these will be used in yourpodcast, so do put in some sensible stuff. Upload Files: Selectone or more mp3 files to add to this note. These files will appear inyour podcast feed. SlashTag this note something meaningful (/audio would be a good bet) and…. PodcastingPodcasting deals with two flip sides of the same coin. On one side there is broadcasting (cyn.in) and on the other, there is pod-catching (devices, other web2.0 services, etc.). What we’ve set up until now is the broadcasting side of the podcasting coin. Let’s check out some possibilities of using the content that we just created.First, a testLet’s see how our podcast feed looks (and sounds) like in Google Reader, a full-featured, free, online RSS ggregrator service from Google.Let’s copy and paste the URL of the podcast feed from the Web Space SlashTag /audio/TheMatrix. And voila! our feed shows up with the standard Google Player. And hmm……. I think I liked the old Google Reader layout better - it was more readable. Whatever. I’ll also take some screenshots from my odeo odyssey, as well. 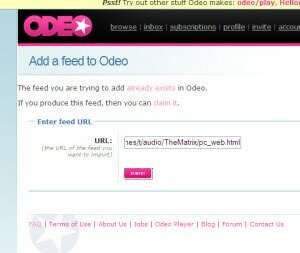 Odeo seems to make it excessively difficult to add an external feed, I had to look in the FAQ. Anyways, let’s see what the odeo playlist creator and player do with our audio podcast feed. Hmmmm…….. not bad. There’s an inbuilt player. With a single click to play any item on the podcast playlist. Not bad at all. :)So what’s all this for. Really.Everybody’s been looking at the Podcast medium to be the next big, no really big explosion. You can be at the forefront of all this, by creating targeted, concentrated spoken content, easily and quickly. Simply record your “Save The World” plan, or your big marketing pitch and save the mp3 file into a note. That’s all it takes for you to get started. Your viewers can use any audio podcast listening service or device to hear all you have to say, without jumping through multiple hoops or you having to bother with how the whole thing works.Try our pre-populated demo today, or better yet, get yourself a cyn.in site. Site pricing starts at $60 for 2 users, and reduces steadily as you add more. Buy yourself a cyn.in site, today.